Tools to help you build and market your website. If you need feedback or have any burning questions please ask in the community forum so we can get them sorted out. Overview of site contents. Includes site map, glossary, and quick start checklist. Contains information about keywords, on page SEO, link building, and social interaction. Tips on how to buy traffic from search engines. Learn how to track your success with organic SEO and PPC ads. Includes information about web analytics. Creating a credible website is core to being linkworthy and selling to customers. Learn how to make money from your websites. Links to useful audio and video information. We will create new SEO videos every month. Coupons and offers to help you save money promoting your websites. View all our training modules linked to on one page. Set up your free SEO Book account, and you will get this tool + 2 other SEO tools valued at over $300 for free. Already have an account? Log in and your installation link will appear in the place of this message. Why do Over 500,000 Webmasters Use Rank Checker? Want to know where your website ranks in the search results? Our Firefox Rank Checker extension allows you to easily check your website rankings in Google (US and international), Microsoft's Bing, & Yahoo Search. Want to learn more? Watch this video and/or read on. 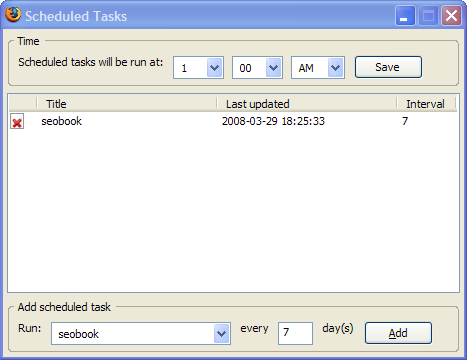 This version of Comodo was built using the core of a prior generation of the Mozilla browser as its core, thus extensions which worked in prior versions of Firefox still work in it. 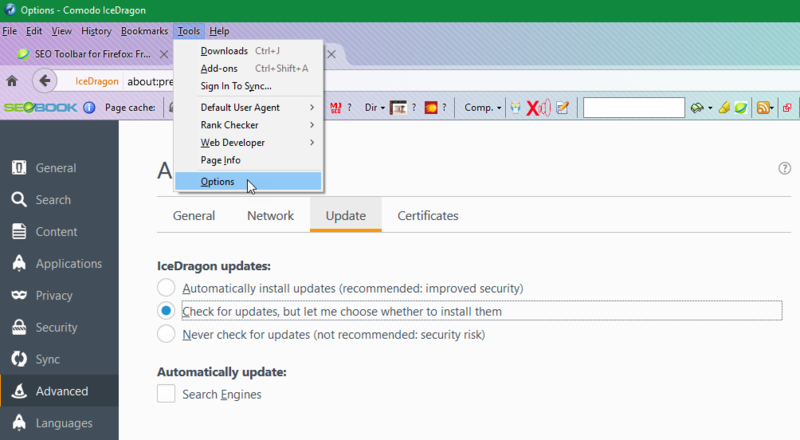 this option is significantly more tedious than using Comodo IceDragon. Once our extensions have been rewritten we will update this page to reflect the change to support the newest version of Firefox. If the Software Installation window is visible click Install Now. See if there is a yellow bar near the top of your browser. Click the Edit Options button on the yellow bar. Click on the words Rank Checker in the bottom of your Firefox browser to activate the tool. 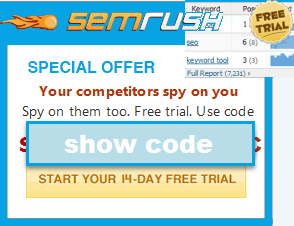 Enter a URL and keyword combination and click the start button to check it's rankings. Off the start this tool is set up to grab data from the Google, Yahoo!, and Microsoft SERPs. After you install Firefox Rank Checker and restart your browser you may want to configure the extension settings to automatically collect data periodically and/or pull data from international Google search results. I like being able to check my rankings real quickly without worrying that some SEO company is aggregating my data and/or spying on me. This tool is open source and hosted on your computer - designed with privacy in mind. If your site is not listed in the top 200 results you will see a - (there are a few of them in the above picture). If you have long URLs and/or long keywords some of them may be cut off in the results display. If that happens you can still see the full page names and keywords by scrolling over them. You can verify your position in the search results by scrolling over the rank number, holding down control, and clicking your mouse on the number...this will open the associated search results in Firefox. If you are logged into your Google account in Firefox this tool will show you personalized ranking results (which tend to make the rankings appear better than they are in many cases). 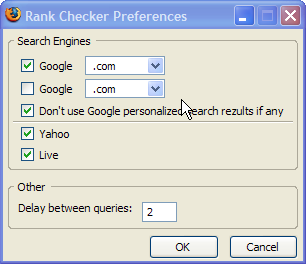 If you want to, you can turn personalized web search off in the Rank Checker options / preference settings window. In the status bar at the bottom of Firefox you can click on the Rank Checker icon at any time to turn this extension on. You can upload keyword and domain name combinations directly in the Rank Checker interface by inserting them one at a time. Next to the add keyword button is a link for adding multiple keywords. 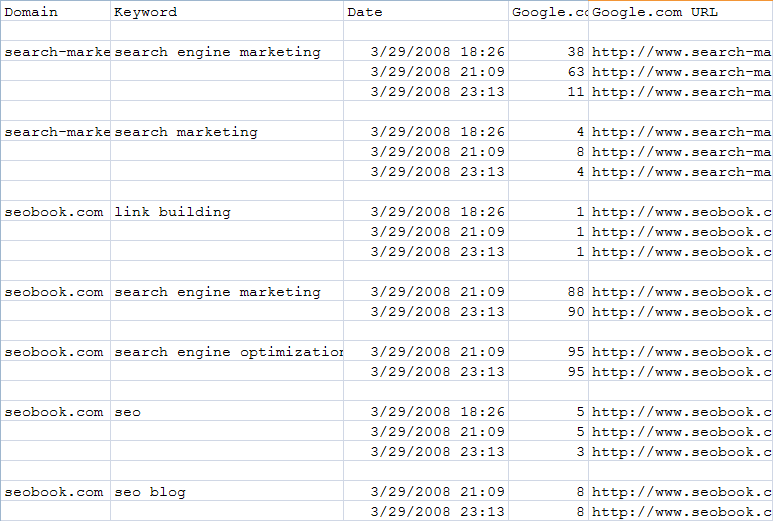 It allows you to upload a keyword list matching a domain. If you want to quickly create a relevant keyword list just to sample how well your site is doing I recommend using our keyword research tool, or our keyword list generator. If after using the tool you want to clear out the interface you can simply close the tool, or if you want to use it again you can click the clear button. International: in the options section (mentioned above) you can select to pull results from international versions of Google and/or Google.com. Presets: allows you to grab a list of keywords that you can research data on at any given point in time. useful for segregating data for different websites, different categories, etc. Scheduled Tasks: allows you to look up any of your keyword lists daily, weekly, monthly, or at any periodicity you choose. Want to Export Your Data? 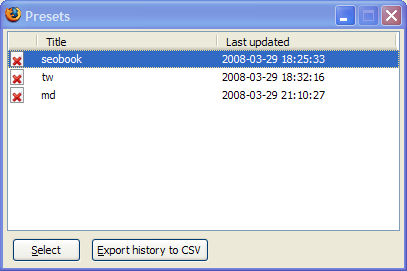 With our free rank checker you can easily export your data to a CSV file. At the bottom of the tool window there is an export button for saving a spreadsheet of your rankings, which is convenient for providing a quick ranking report for clients. These results can be viewed in any spreadsheet program like Microsoft Excel, Google Docs, or Open Office. Add proxy support (although this is already baked into Firefox - there is even an extension for switching proxies). 3 things that may cause results to differ when you use Rank Checker vs when you search Google directly. personalization - if personalization is on (which is on by default when you search) then the results you see might be different than the results other see. This is true even if you are not logged into an account results can be altered by your recent prior search queries & the location of your computer. To remove personalization bias, we offer an option that turns it off. clustering - to send Google less queries we grab 100 results per page. If 2 pages from the same site are in the search results they may be clustered together, so in many cases a low ranking page will see rankings shown even lower on our tool due to clustering. If you add &num=100 to the address bar in Google the results should be fairly well aligned with our tool. datacenter and algorithm changes - at different times of day your query might access different datacenters, and algo changes also happen all the time...Google did around 450 algorithm adjustments in 2007. Even if the numbers do not exactly line up they are still good for helping you see the general ranking trends. In most markets Yahoo! Search is powered by Bing. In Japan Yahoo! Search is powered by Google. In spite of being built off the same underlying initial index, Yahoo! search results may be significantly different due to insertion of other Yahoo! properties like Tumblr in their organic results. There are a number of other browser based extensions display other related SEO information. Advanced users may want to give SEO for Firefox a try. The SEO Toolbar is also easy to recommend, as it puts all kinds of useful data right in a toolbar. We offer a list of related useful extensions on our SEO extension page. Have Feedback? Know of Any Conflicting Extensions? If it does not work then throw your computer out the window, or leave feedback and read comments left by others here. Historical performance data: going all the way back to last decade, before Panda and Penguin existed, so you can look for historical penalties and other potential ranking issues. Risk-free: Free trial & low monthly price.